You're a jumped up pantry boy who doesn't know his place! 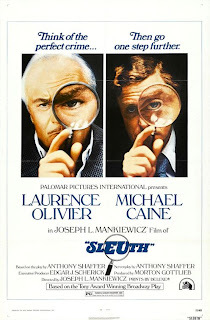 Games, toys and playthings play a central role in Sleuth; the film opens with a series of grotesque paintings of plays which, due to their high angles and composition, makes them seem like stills of marionette theatre; at one point the camera drifts through the house of Andrew Wyke, an aristocratic crime novelist, showing us his collection of hundreds of clockwork toys, from a laughing mannequin to a bear that drinks water from a jug; and, most importantly, the film revolves around a sly and serpentine game of misdirection and deception, carried out by Wyke against Milo Tindle, the young man who seeks to marry his estranged wife. The 'game' starts when Wyke proposes that Milo should break into his house, steal some expensive jewelery, then fence it. Milo would gain a considerable amount of money as a result, whilst Wyke would get far more from the insurance company. Milo agrees, and the game begins, with Wyke playing the role of mater puppeteer, orchestrating the perfect crime, but what crime does he wish to commit? Sleuth is a story about human malignancy, about our endless capacity for cruelty and deceit. This is not apparent right off the bat, as the film opens with Wyke, played by Laurence Olivier, dictating a manuscript for his latest novel in the centre of a hedge maze whilst Milo, played by Michael Caine, tries to find a way to him. The film proceeds at a similarly off-kilter pace for some time as tension between the two men broils and bubbles, barely hidden by their barded remarks and reciprocating witticisms. However, once Wyke makes his proposal, the film takes on a subtly darker edge. Even as the two engage in roleplay when choosing a costume for Milo to wear and they continue to offer up jokes to each other, there is a sense that all can not be as it seems; the crime is too easily carried off, the cover-up so well formed that there must be more to it than what appears on the surface. Wyke goads Milo with racist attacks on his Italian heritage, referring to him as a 'Wap' and 'Dago', he visualises the crime much too keenly and derives far too much pleasure from his own concoction, treating crime fact as crime fiction, forever the author, never the character. Anthony Schaffer (who also wrote The Wicker Man) adapted his play for the cinema and, although there are some external shots of Wyke's vast country manor, it feels very much like a play. There are only ever two characters on screen, be it a combination of Milo, Wykes or the policeman who investigates them, and there exchanges are noticeably verbose and theatrical. The sudden shifts in tone from sentence to sentence, one moment deadly serious the next light and delivered in a cod-German accent, suggest its origins on the boards and the high-energy that the leads bring to their respective roles seem to be for the benefit of anyone sitting in The Gods, rather than for the audience in a cinema who won't have trouble hearing them. This could all distract and make for a wooden adaptation but it works thanks to the two great central performers who, quite rightly, both received Best Actor nods for their work. As I've said, the two deliver their lines with an energy and intonation that is theatrical and somewhat inappropriate, given the medium, but both underpin their exuberance with steel, and they hurl abuse and jokes at each other with such wanton abandon that their theatricality passes by relatively unnoticed. Both know that their character is distrustful of the other, if not downright hateful of them, and their outward energy always serves as a disguise to how they are really feeling. This makes the moments when their masks fall away all the more effective as we see that malignancy and bile that I alluded to early. Allusions abound in this review, which is pretty much solely because I can't talk about the film in any detail without spoiling it, to some degree. Whilst the characters play a game with each other, the film plays a game with the audience, taunting us and teasing us. Joseph L. Mankiewicz doesn't direct the film so much as misdirect it, pointing us one way only to come up on us from behind, delivering twists and surprises that make the film so thoroughly thrilling. To talk about it to much is too ruin it, since you can not enjoy this game if you know the rules. Play the game, enjoy the ride, worry about humanity.